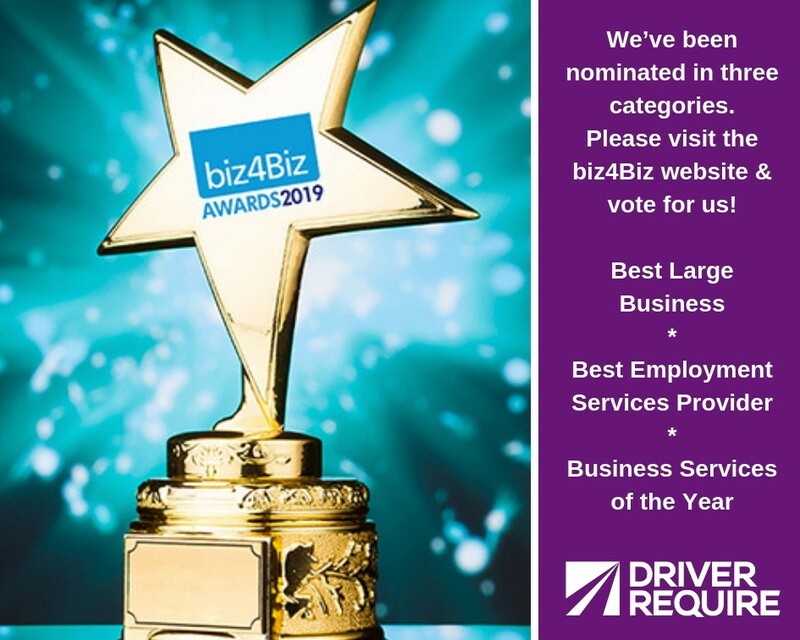 Driver Require has once again been nominated in The biz4Biz Awards! The aim of the Awards is to recognise excellence in business across Hertfordshire and we need your support. It’s quicker than making a cup of tea, so please just take a couple of minutes to vote! It’s really simple and free, all you have to do is to register and create an account, which is a quick and easy process. You’ll then be able to nominate and vote. Go to www.biz4Biz website or click here to Register. Click the Register button to create a personal account, then just fill in a few simple details and then you can vote for us. A confirmation email will be sent to your email account with a link back to the biz4biz website to complete the registration process. (This is an essential part of the process so you may need to check your spam or junk email boxes). As soon as the Registration Process is complete, you’ll be able to Vote for us – voting is open until 15th February 2019. This award is open to recruitment, HR, training providers, coaching, mentoring, Health & Safety benefit providers, incentive providers. This award is open to any business that has a turnover in excess of £3m. They should have a clear marketing and development strategy for future expansion and demonstrate exceptional financial returns, strong growth, innovation strategies, and market prominence in their sector. This award is open to Hertfordshire-based businesses that provide professional services to SMEs, such as business consultancy, quality management systems, infrastructure and operations management, sales force development, facilities management, property services (architects, valuers and quantity surveyors), property/site and/or office plant maintenance, car hire, business travel management, language translation, delivery/freight services, catering, cleaning, waste and recycling, etc. Nominees will be chosen from the top 20 companies with the most votes in each category and will be invited to make a presentation to a judging panel in March. Online voting is open until 15 February 2019. These are impartial, independent awards that can be won by anyone involved in business in Hertfordshire. Go to biz4Biz for more info. Please share and thank you, we really appreciate your support! SEARCH JOBS & QUICK APPLY NOW! Registered in in England and Wales.